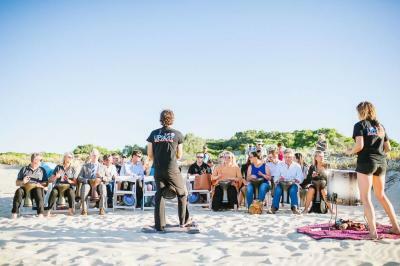 As part of Accor’s Feel Loved Week in February, Pullman Bunker Bay held a showcase to highlight just how special an event in the Margaret River Region can be. While dining on exquisite regional cuisine, guests sampled award-winning Brown Hill Margaret River wines, explored Pullman’s wonderland of indoor + alfresco event spaces followed by an immersive drumming lesson on Bunker Bay beach conducted by Upbeat Inspirations. They then enjoyed cocktails in a beautiful lawn marquee styled by South West Event Studio while an acoustic musician provided by Down South Entertainment set the tone for a quintessential relaxing Margaret River event.